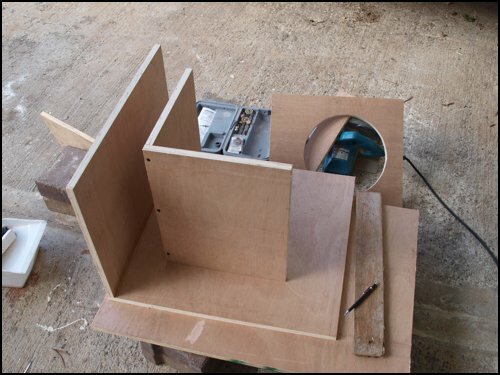 The Subwoofer DIY Page - Projects : "Proof of Concept #2"
Tapped Horn "Proof of Concept #2"
I was approached recently for help with a particular project, and I thought it was about time for another try at another "proof of concept" tapped horns. This time I elected to use a fairly cheap pro audio driver that recently became available - the Parts Express PA310-8. This is a 12" pro audio driver with decent specifications that was available for $75 (not including the cost of getting it to me, of course). The low Le was a bit of a surprise. It can actually affect the response in the pass-band, but this can be corrected if necessary with an external inductor wired in series with the driver. After trying and disposing of several different variations, the images below represents the HornResp simulation that I finally decided to use. The result should be a small (4.3 cu.ft. 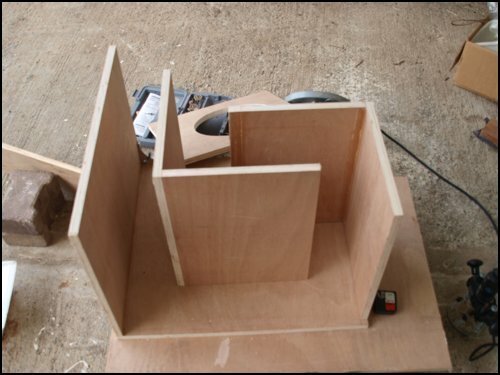 net) box that's capable doing a decent 40 Hz to above 100 Hz, that could be built with one sheet of 4 x 8 plywood. Coming up with a folding scheme that met the basic requirements of the simulation was somewhat challenging. 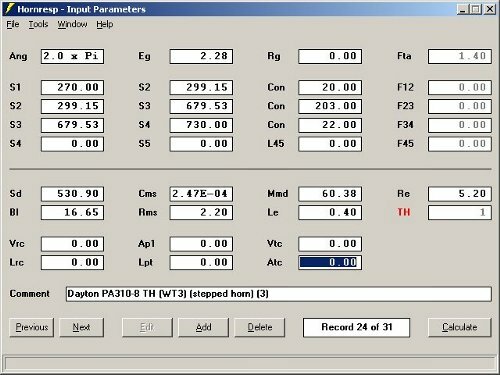 I ended up creating an Excel spreadsheet that allowed me via the "Goal Seek" function to determine the optimum cabinet dimensions for a tapped-horn corresponding closely to the HornResp simulation parameters with a stepped and tapered path as indicated in the diagram below . I also configured the spreadsheet to give me the dimensions of each panel making up the box. I deliberately left out any bracing, so I could later objectively determine the impact of adding bracing to the box. Not included in the above list is the panels required to brace the enclosure properly. 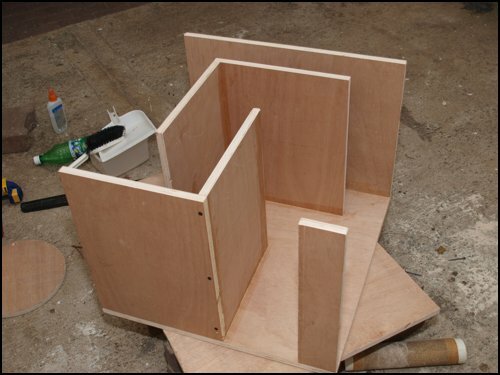 I then proceeded to build the box (see images below). Ingredients: one sheet of 4 x 8 3/4 ply, box of drywall screws, wood-glue, a few bricks (to act a temporary table), some mounting screws for the driver and of course the driver. 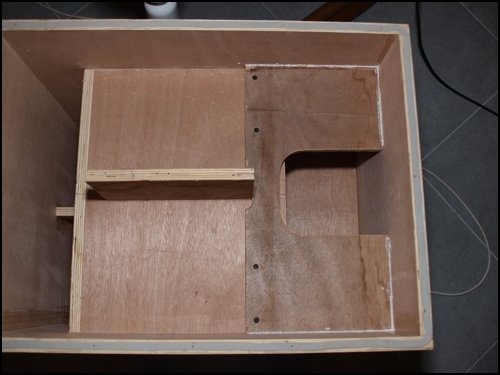 I left the top and bottom panels as removable panels (only screwed into place, rather than screwed and glued), so I could easily add and removing damping and bracing to each section of the enclosure. My eldest daughter decided to help me with this build. The tapped-horn seems to be performing as expected, with that "effortless sound" that characterized my first proof-of-concept build. Output is quite extraordinary in its pass-band (particularly when you consider that this is a $75 driver with 5mm Xmax!) 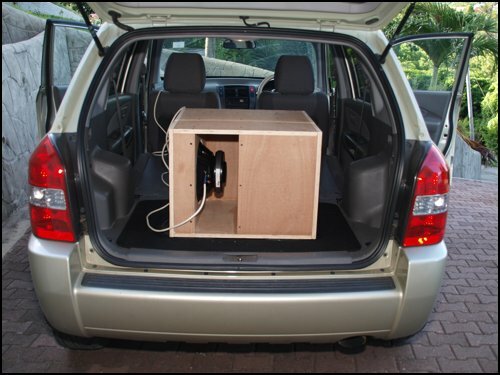 - it managed to get all the cupboard doors in the garage vibrating during some of the SPL tests. 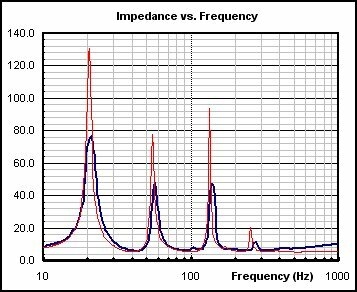 I've posted the an image of the impedance response below (taken after the enclosure was properly braced), which indicates how close the measured results match the impedance curve predicted by HornResp. While it's a close match, a closer look at the measured impedance suggests that the horn's resonant frequency is around 43 Hz, a little higher than predicted. 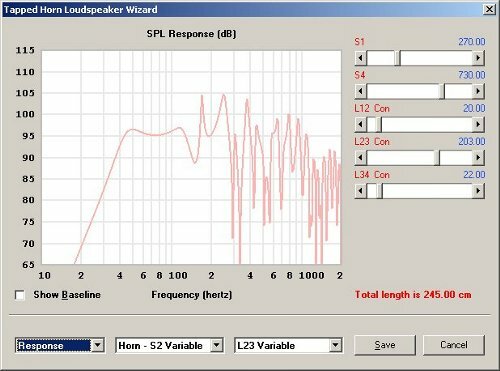 The image below shows the measured frequency response, compared to the HornResp predictions. I used the close-miked method, which may not be accurate enough for this test. Getting rid of the "notch"
I've discovered that it's possible to get rid of the "notch" in the frequency response around 150 Hz by attaching a panel at the 3rd bend that cuts the cross-section down by 2/3rds. I've called it the "dogfood duct", due to the way that I initially came across and tested the idea. 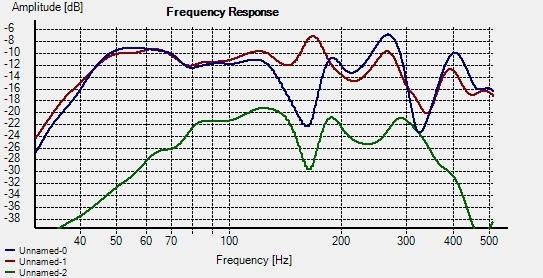 With the addition of the duct, the frequency response changes as indicated in the graph below, with before in blue and after in red. 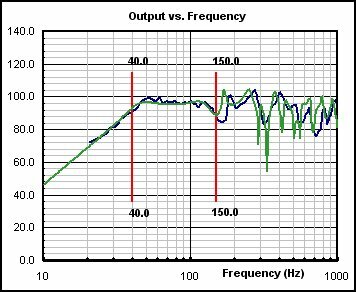 Given in green is the response as measured at the duct itself, showing the appearance of the notch (without the duct, the frequency response in that area measures quite flat). 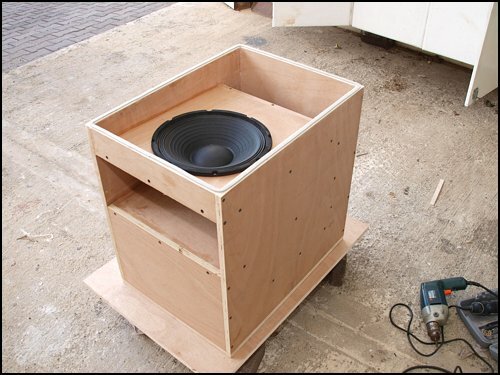 The duct also shifts the resonance frequency of the horn down a little, from 43.7 Hz to 39 Hz. This is actually a good thing for this particular design, as it flattens the response a bit. It's possible that the addition of the duct will cause compression problems at higher power levels, but I need to perform more tests to confirm if this is actually happening. Indicated in the graph below is how the frequency response changes with the addition of the "dogfood duct".